A good mango harvest augurs well for paddy production, says a popular Oriya folklore. So, many farmers in paddy-intensive regions of the state, such as Bargarh district, plan their paddy-selling quota on this basis. Another popular folklore in Orissa links good tamarind harvest to floods. There are many such examples from across the country. With geographical impressions of many generations embedded into it, folklore is a perfect indicator of ecological patterns of an area. But mainstream science regards it very disparagingly. So when Artabandhu Mishra, a scientist with the life science department of Orissa's Sambalpur University, came out with a compilation of Oriya folklore about drought forecasting, it amazed many of his compatriots. The Regional Centre for Development Co-operation -- a Bhubaneshwar-based non-governmental organisation that works on drought mitigation -- has published it. The compilation also includes two chapters on chronic drought in Western Orissa. Says Mishra, "Folklore is based on extensive weather observation over centuries and that is why it has become part of common life." Much of his compilation is derived from oral traditions, though there were written treatises to guide him as well. According to one of them -- Khanabachana -- clear skies on a full moon day of Kartika month (usually November) suggests a splendid Rabi (winter) crop. But if it rains that night, the treatise advises farmers not to venture into farmlands. The same collection also notes that "Five Sundays in few months in a year presage simultaneous droughts and floods in many places." There were five Sundays in March, May, August and November in 1992. India had both floods and droughts that year. 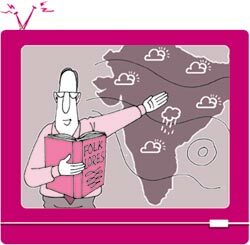 Folklore from different regions has locally specific geographical indications for forecasting rain and drought. For example, sparrows bathing in the dust, ants carrying pupae and goats creating a din suggest impending rains in different places. In 2003, long before the Indian Meteorological Department's (imd) prediction, the Bhil tribes of Rajasthan were preparing themselves for tough times. For, their folklore says when khair (acacia catechu) trees become extra bushy and wild cucumbers sprout unusually everywhere, a drought is imminent. It happened exactly that way in 2003 and Bhils left their villages much before the imd prediction. If it warns of a disaster, folklore also suggests ways out. A popular Oriya saying, for example, advises farmers, "Start cultivation with five people and take loans in a group." There is thus mention of self-help groups and community farming in traditional knowledge. Much of such knowledge has been written down and is available in local markets in rural areas. Among them are farmers' panchangs or almanacs, which have been in use since the 4th century bc. Based on folklore, astrology, rituals and ancient literature, the 30-odd panchangs in vogue across the country are the closest equivalents to the Old Farmer's Almanac, published in the us. The Council for Scientific and Industrial Research is now documenting such knowledge through its Journal of Traditional Knowledge. But efforts to scientifically evaluate weather forecasts made by folklore have largely been sporadic. P R Kanani, V J Savaliya and B C Rawal -- of Gujarat College of Agriculture, Junagadh district -- are involved in one such attempt. Starting May 1990, they collected daily rainfall data for close to five years and crosschecked them with traditional forecasts. The latter were found to be remarkably accurate. Mishra, however, adds a caveat. He notes that some traditional forecasts might not be accurate anymore because of climate change. While compiling his book he found folklore mentioning 120 days of rain in Orissa and all rainfall forecasts were based upon this. He then studied the state's rainfall data from 1850 ad to 1880 ad and 1950-1980 and found the average days of rain to be 90. This figure has come down to 50 now.